It is with great sadness that the Austin family announces the passing of David C. H. Austin Snr OBE VMH, rosarian and founder of David Austin Roses Ltd. David Snr died peacefully at his home in Shropshire on Tuesday 18th December, surrounded by his family. He was 92. 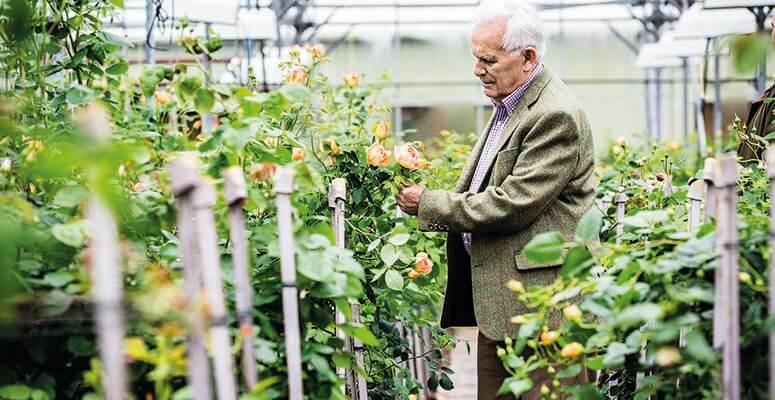 For over 75 years David’s dedication to roses brought fragrance and beauty to gardens all over the world. A perfectionist at heart, he bred more than 200 English roses during his extraordinary career, unwaveringly in pursuit of an ever more beautiful rose. From a farming background, David developed a keen interest in Old Roses in his early twenties. David felt that although the Old Roses were charming and often had magnificent fragrances, they were lacking in the colour diversity and ability to repeat flower common to the more modern Hybrid Teas. This realisation sowed the seeds for the collection of English Roses that we all enjoy today as he set about creating an entirely new rose which combined the beauty and fragrance of Old Roses with the benefits of modern roses. His first English Rose was Constance Spry launched in 1961. Amongst the expansive collection, notable varieties include Gertrude Jekyll ? twice voted the nation’s favourite rose ? and more recently, Olivia Rose Austin. David was rewarded for his outstanding contribution to horticulture, receiving gold standard accolades at the RHS Chelsea Flower Show, and an OBE for services to horticulture in 2007. “My father ? or Mr A as he was affectionately known within the wider Austin family ? was a remarkable man. His love for the art of rose breeding was truly inspiring; he loved nothing more than seeing the pleasure that his roses gave to others.